Chance The Rapper announces a gift of $1 million to the Chicago Public School Foundation during a news conference at the Westcott Elementary School, March 6, 2017, in Chicago. The Grammy-winning artist is calling on Illinois Gov. Bruce Rauner to use executive powers to better fund Chicago Public Schools. After announcing Monday that he’ll donate $1 million to Chicago Public Schools, Chance the Rapper is expected to offer a list of CPS schools Tuesday that will each receive an additional $10,000 in funding from his organization. During Monday’s press conference at Westcott Elementary School, Chance, whose real name is Chancellor Bennett, announced that his not-for-profit would be accepting further donations for CPS on its Social Works website. For every $100,000 raised on the site, Bennett promised to chip in an additional $10,000. 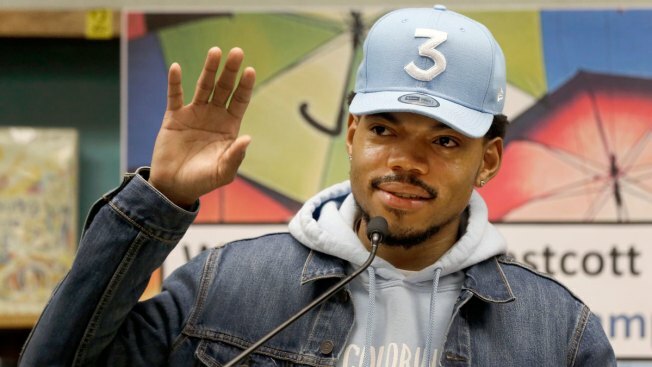 The Chicago rapper said he would start Monday by donating $100,000 to fund arts and after school programs at ten different CPS schools, including Westcott Elementary. As part of the plan, each school will receive an added $10,000 in funding from Bennett’s organization. “Ima wait till tmw to start announcing Chicago public schools that are receiving 10k BUT YOU CAN HELP us here,” Chance tweeted Monday alongside a link to his organization's site. Following a series of “unsuccessful” conversations with Gov. Bruce Rauner, Bennett announced Monday that he's donating $1 million to CPS as the underfunded district continues to languish amid the state’s ongoing budget impasse. Bennett slammed the governor Friday for vetoing $215 million in CPS funding last December. Rauner nixed the funding after claiming Democratic leaders backed out of a deal to pass comprehensive pension reform. “Governor Rauner, do your job,” Bennett said Monday. What's Next for AFSCME After Strike Approved? The governor’s office circulated a memo Monday outlining paths for the state to address the CPS' $215 million funding gap. One plan would authorize Chicago to use Tax Increment Financing money to fund the beleaguered district. TIF funds are typically used to promote investment and economic development, but developing legislation would allow Mayor Rahm Emanuel to approve a one-time transfer of $215 million from Chicago's TIF funds to CPS. The other approach would add the CPS request to Senate President John Cullerton’s pension reform bill, which is tied to the Senate’s “grand bargain.” The bill failed to pass the Senate last week for the second time. On Monday, Rauner's office said, "Individual contributions will never be enough to address the financial challenges facing CPS." Rauner and his wife have donated $7 million over the past 20 years to organizations benefiting CPS students, according to the governor’s office. "It would be helpful if CPS officials came to Springfield and joined in serious good faith discussions about the long-term stability of all of our schools,” Rauner spokeswoman Eleni Demertzis said in a statement. Bennett, who attended Jones College Prep, said he saw Rauner’s latest plan, but wouldn’t comment on the specifics. “I want them to fund CPS. It’s not my job to propose any policy or be behind anything other than the kids,” he added.